Are you a leader, a creative or a change agent? THEN this group could be a powerful and life changing next step in your work and life. 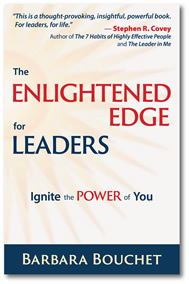 This seminar will work with principles from my book, The Enlightened Edge for Leaders: Ignite the Power of You. The book will be used as a launching pad to greater personal and professional expansion. We will focus on how you can emerge as a more powerful change agent so you can lead both yourself and your client to greater expansion, freedom, and fulfillment. This is a fantastic opportunity to work deeply and powerfully not only with me, but with a group of dedicated professionals who are each committed to greater mastery and transformation in their lives. To Get More Information or to Sign Up! Please call Barbara at 206-361-4730 or email. We can talk about what you need and to make sure this group is a good fit for you at this time. We can also discuss dates, cost and additional information for this program. If there are other people you would like to have join you in this adventure, please share this information with them. Sharing an in-depth process like this with a friend or colleague can be very enriching. If your organization needs more of an Enlightened Edge, I would be happy to connect with you and/or your manager to discuss the group, how it might benefit the organization, and to ensure alignment. If you want to sponsor a workshop, or have Barbara speak at an event, let’s talk! Please call or email. “I read this book hoping to find some tools and tips that would be helpful in my coaching practice. I did not expect the profound insight it gave me about my own life. I highly recommend you read it twice – once for yourself and once for the leaders in your life.” — Jillian Ihsanullah, PhD, Principal Consultant, Linkage, Inc.